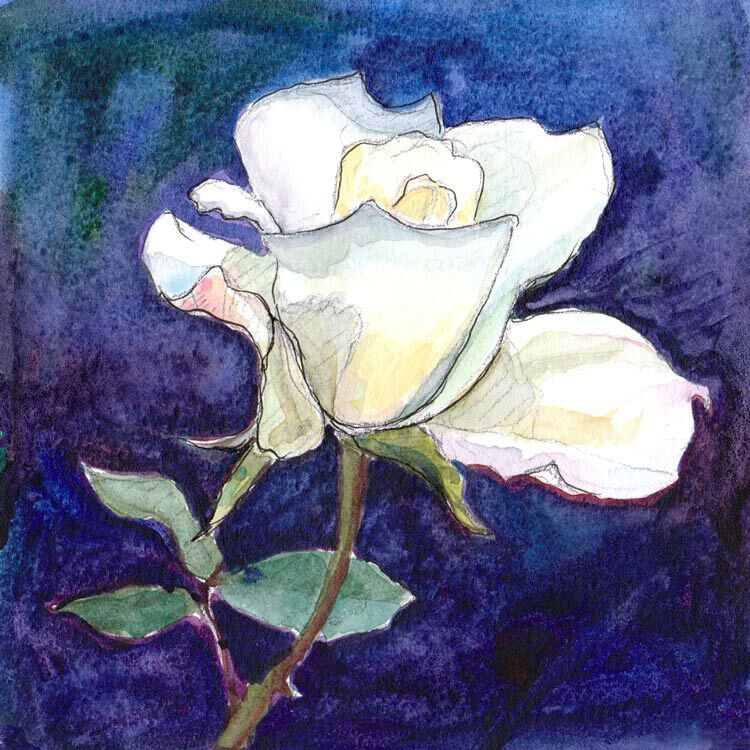 White Rose Version #2, pencil & watercolor 5x5"
This morning when I was watering the roses I noticed that the one I sketched yesterday (see below) had opened and was even prettier today. But it was way too hot to sketch outside so I cut the rose and brought it in. Then it was way too hot in the studio too, even with all the blinds closed and the lights off. Trying to ignore the heat, I put the rose in a vase on the drawing table and shined one small light on it, with no light on my sketchbook and tried to really focus on the drawing instead of just approximating the shapes. It’s amazing how focusing on drawing makes the problems and discomforts of the world just drop away. But when the drawing was done, I couldn’t take the heat anymore and dragged the portable air conditioner into the studio. Ahhh relief. I tried to be more careful with the washes for the shadows than I was yesterday, to keep the white rose white and let the shadows define the form. I’m happy with the way it turned out. 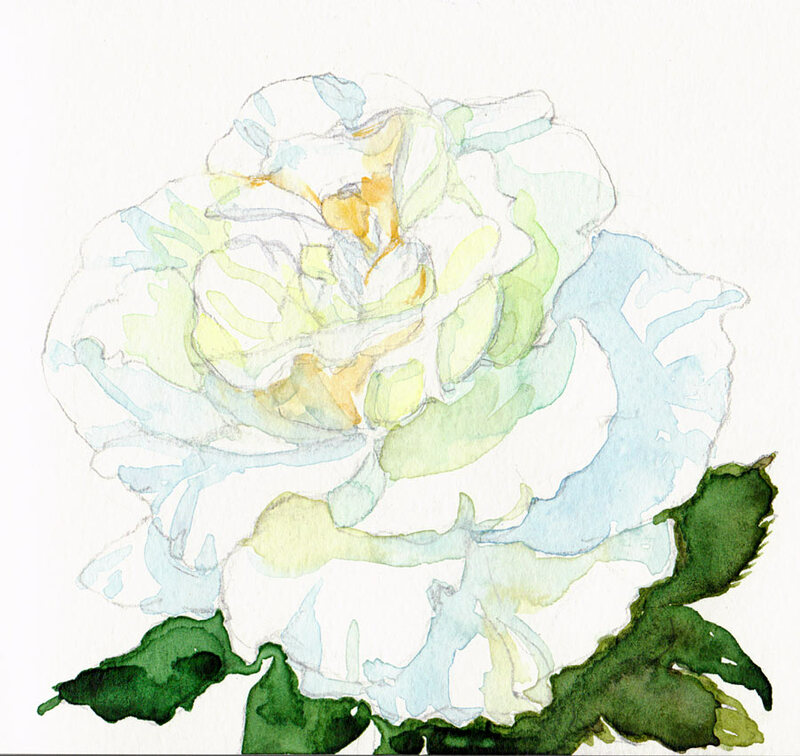 White Rose Version #1, ink & watercolor 5x5"
…so then I added some lines with my Micron Pigma which just made it worse. At that point there was nothing I could do but close the sketchbook and look forward to the day when I finally learn the lesson of stopping while I was ahead! Previous Post: Are You a YES or a NO (or a Maybe)? The second picture is lovely and soft and you stopped before you put in dark background etc. It’s hard to know when to say when, to go on and overdo it. I wreck many pictures by getting carried away with outlines when I should stay softer! I wanted to go to the beach yesterday for a picnic (it’s about 20 degrees centigrade at present) and sketch but ‘the driver’ said, let’s just go into town to eat Chinese food. So no drawing! carried away, as you said, then to call it overworking. You are too hard on yourself! Both are beautiful – just different. I find #1 to be more dramatic and #2 to be more delicate. Oh yes – If only we could have do-overs in art. I always seem to go one step too far. I still like your second painting, but the delicacy of the first one is really inspiring. I can’t believe you drew that in the dark! I’m not sure I could do that well in the light…. I’m agreeing with Shirley. They are both really beautiful. OK, maybe the lines did change the feel of No. 1, but the color of the leaf stem against that background blue is a knockout. I agree–they are both beautiful, but very different. Have you tried washing off a watercolor like #1, and redoing it. Just put it under the faucet and scrub it off. Usually leaves a very delicate ghost of the original painting which can then be enhanced as desired or left alone. Guess, this would be difficult in a sketchbook, though. But, I can visualize putting the body of the sketchbook in a plastic bag and washing away on the exposed sheet. You will be surprised at what’s left. What a wonderful way to work — without looking. Sometimes, when I’m writing fiction, I make the print on my screen really tiny and then I type without reading for half an hour and see what happened. sometimes good, sometimes not so much. It is hot, isn’t it? I love it, but maybe only because I know it won’t last. Hi Lily, I love that idea of typing what you can’t see! That’s a great idea. the light on the roses…I could see what I was doing, just not very well. Jana, you are just a MASTER at capturing the luminecense of white. I like the idea of definition through shadow. But mostly I like these take-charge, devil-may-care petals, an effect stronger in the second rose. These petals make me think of ship’s sails. It’s funny how strong very delicate natural things can seem, close up. There’s that thorny, bowed-out stem, like a mast. It reminded me of a painting I just saw at VMI, a misty battleship deck, with a single railing well defined and in the extreme foreground. Like this bold stem, it “took command” and made the whole picture surge out at you. Well, I see just the opposite of what Sherry does. I am trying to turn this into a seascape, but the gorgeous thick blue-purple background does suggest a storm at sea. Sweet, I found your site in the ‘possibly related posts’ under my new post today. Love your work. Just a thought, but why not get bolder with the ink in #1? What do you have to lose? By defining your original line sketch with really bold black ink lines it might equal out the dark dramatic background (which I really like). I think it still has potential and after all every painting is a lesson in itself. ps I’m going to add your link on my page.